A ball joint is used to act as a universal swivel joint that connects the upper or lower control arms to the spindle which is where the axle bearing and wheel is supported. This joint is also responsible for allowing the steering to work as it is the bottom part of the pivot for the spindle. Constructed of a metal housing with a spherical metal ball, the ball joint is designed with the threaded stud attached at one end. This ball joint stud is designed with a slight taper which will lock into a tapered hole which offers a measure of strength when attaching the ball join to the spindle. The ball is trapped inside the housing with enough clearance to move freely without play. Grease is used to lubricant the joint which may have a Zerk fitting that is used to refill the joint at regular service intervals. Most cars today have non-serviceable joints which are equipped with enough grease to last the duration of the ball joint's usability. To replace or perform repairs on or near the ball joint such as replacing a control arm or a CV axle the ball joint will need to be undone which means taking the nut off of the joint and applying pressure while striking the spindle or control arm bulk head with a hammer. 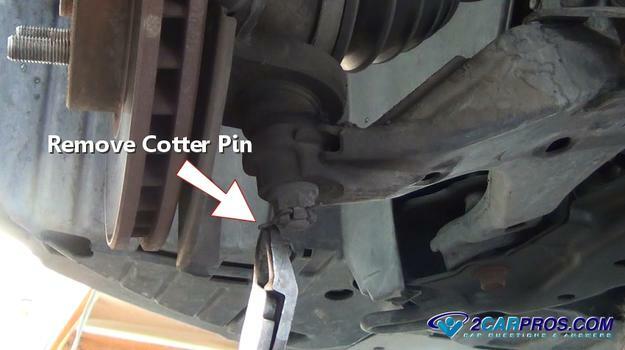 Some ball joints have a cotter pin which is used as a safety device to keep the nut from coming off and the joint coming undone. Other designs have a self locking nut that doesn't require a cotter pin. 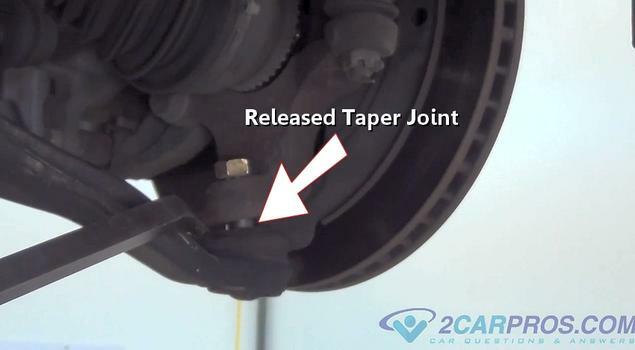 The most difficult part of removing any ball joint is disconnecting the taper fit stud at the end of the joint. 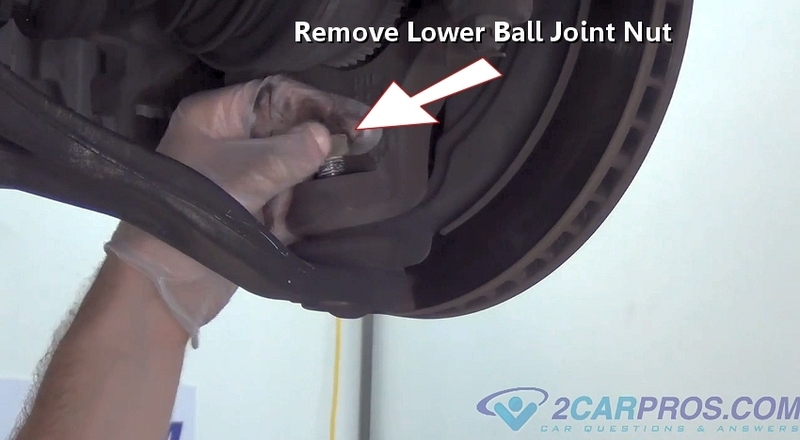 Some ball joints are made into the lower or upper control arm while in other applications the joint can be unbolted separately. It is strongly suggested to have the car aligned after replacing a ball joint. When the ball joint wears due to usage and the normal travel of steering and suspension parts the joint will have excessive play that will cause problems such as allowing the steering wheel to shake while driving and making popping and clicking noises as the car is being driven and going over bumps. Ball joint wear can also contribute to irregular tire wear. A ball joint without a control arm attached will run between $15.00 and $26.00 (US) each on Amazon. If the ball joint is not serviced separately and is included in the control arm you can expect to pay between $46.00 and $92.00 for each arm. The labor to replace a ball joint with the control arm will be between $120.00 and $180.00 depending on the manufacturer. To replace the ball joint by itself will run about the same for labor. The car must be jacked up off the ground and supported on jack stands. 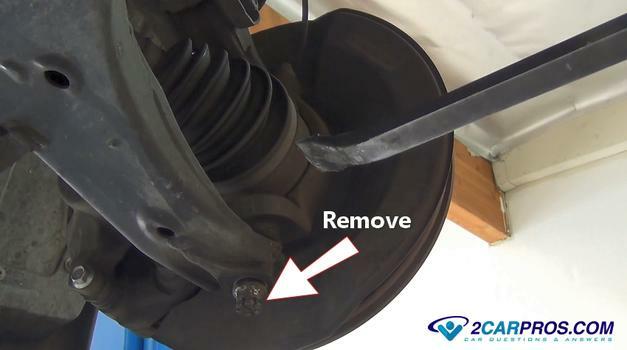 You may need to remove the wheel to be able to access the ball joint more freely. There are two styles of ball joint, one faces downwards while the other faces upwards. Each are similar and will require different placement of the breaker bar to undo. We will demonstrate both styles in the guide. All ball joints connections are a tapper fit that must be released to come undone. This guide is for strut style of suspension which has the coil spring encapsulated within the strut. 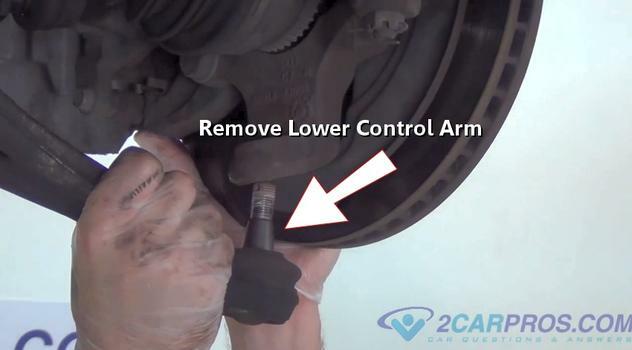 If this job is being done on a live spring style of suspension the lower control arm must be supported using a jack and then slowly lowered once the ball joint has been undone. 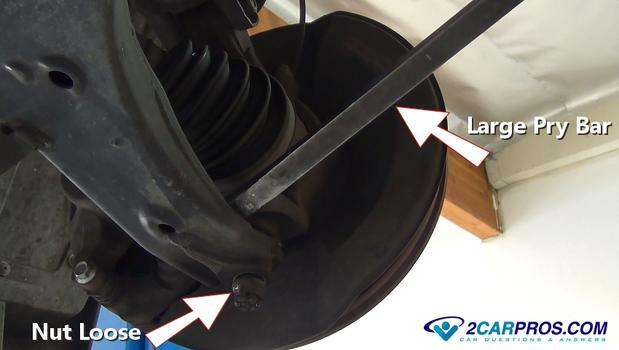 A live spring suspension is one that has the spring pressed against the lower control arm. This spring is very strong so caution should be used when dealing with this spring. A cotter pin is used to keep the connection between the ball joint and control arm in tact in case the nut comes loose. The nut in the image below is called a castle nut which has 6 places in which the cotter pin can hold the nut from moving. Use a pair of side cutters (dikes) to remove the cotter pin from the castle nut which will enable the nuts removal. 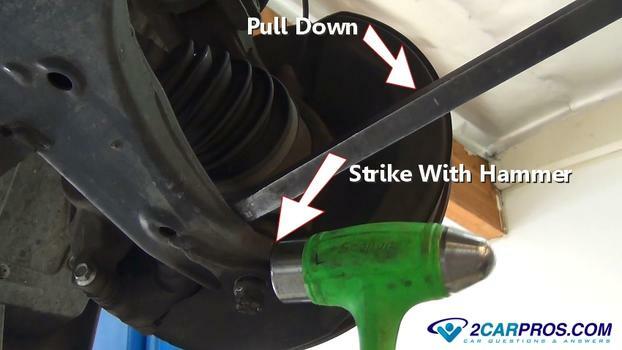 Use a 19mm to 22mm wrench or socket to loosen the nut by turning it counterclockwise. 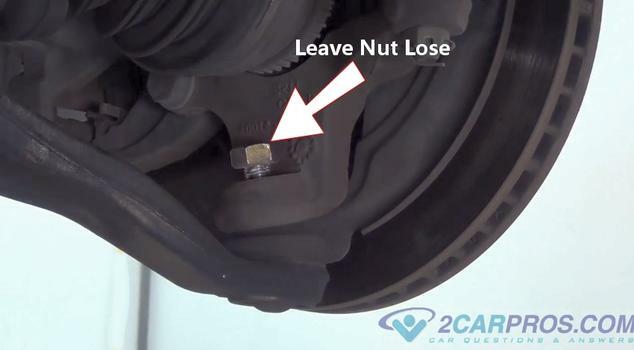 These nuts can be fairly tight so make sure the socket or wrench is squarely on the nut before applying pressure to avoid rounding and damaging the nut. Do not fully remove the nut, leave it on the stud about three turns to protect the stud threads when undoing the joint. Use a large pry bar and wedge it in-between the lower control arm and the spindle bulk head. Make sure the pry bar is in a solid place because you will need to apply pressure to undo the joint. While applying force downward strike the lower control arm bulkhead to release the ball joint taper. 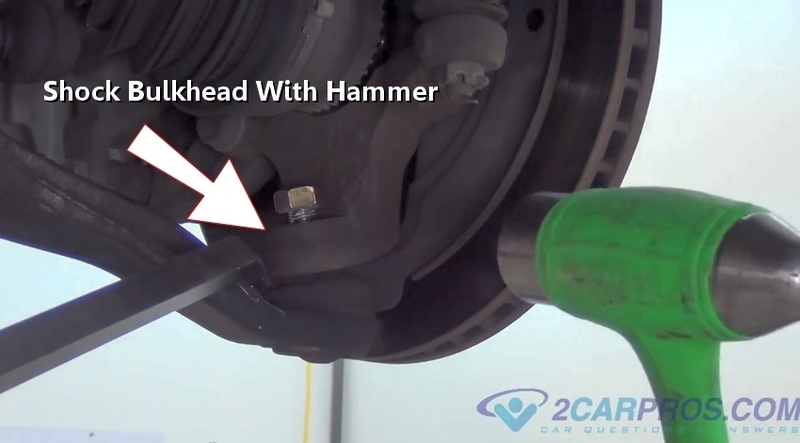 This will take more than one hammer strike to get the ball joint to release in most cases. If you have trouble with this step have a helper apply additional pressure on the pry bar while using a larger hammer to make the strikes. This will "shock" the joint loose and you should feel a pop when the joint releases. Once the ball joint has released finish removing the lower ball joint nut and continue with the repair. 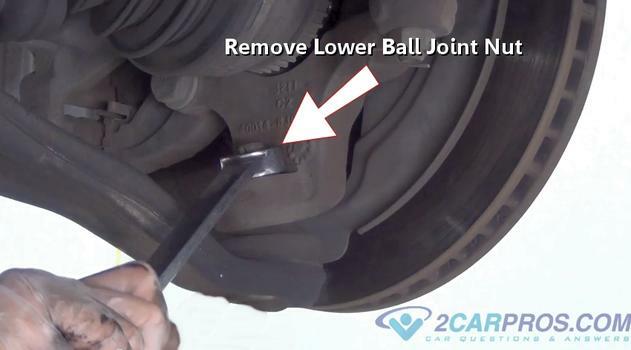 We will demonstrate the upward style of ball joint below. After the cotter pin has been removed use a 22mm to 24mm wrench to remove the lower ball joint nut by turning it counterclockwise. It is okay if the steering turns during this step. Once the nut is loose do not remove it completely. Leave the nut on the ball joint stud a couple of turns. This will protect the threads when disconnecting the joint. Again wedge a large pry bar while apply downward pressure between the spindle bulk head and lower control arm. While still holding the pressure on the ball joint use a hammer to "shock" spindle bulkhead this time. It may take a couple hits of the hammer but hang in there until the ball joint taper releases. When the ball joint taper joint releases, there will be a noticeable gap between the ball joint dust boot and the spindle. The gap between the ball joint nut and spindle will also be gone. 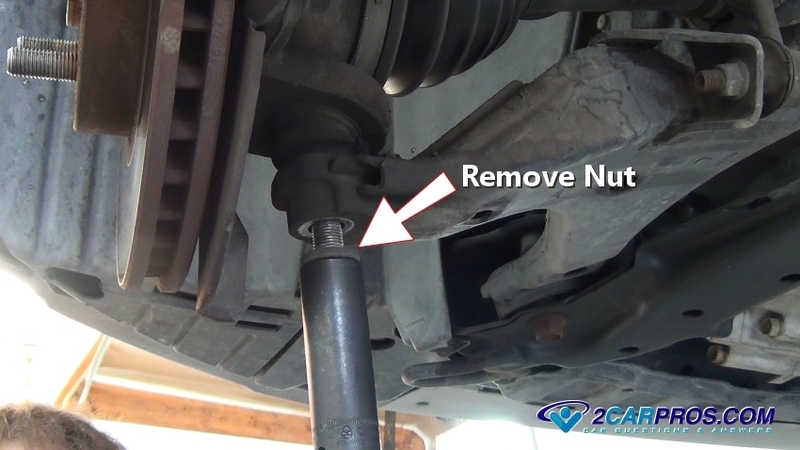 Now you can finish removing the ball joint nut. Grasp the lower control arm while holding the spindle steady. Pull the lower control arm downward to disconnect it from the spindle. At this point the bottom of the spindle will be able to move around freely. This method will work for both upper and lower control arms. If you have any ball joint questions please visit our forum. If you need car repair advice, please ask our community of mechanics is happy to help you and it is always 100% free. We hope you enjoyed this guide and video. We are creating a full set of car repair guides. Please subscribe to our 2CarPros YouTube channel and check back often for new videos which are uploaded almost every day.